Automated manual transmissions are suddenly being touted as the greatest invention since sliced bread. So, we get behind the wheel of Maruti’s much-anticipated all-new model to find out if that’s really the case. According to Maruti-Suzuki COO, Mayank Pareek, the share of the market that automatic transmissions hold in India is just 5% – and that too at the stratospheric end of the scale, you would imagine. But Mr Pareek isn’t satisfied with status quo – he’s thinking “Killer App.” Maruti clearly wants to change the game, and so they’ve introduced the (slightly unfortunately named) Maruti Suzuki Celerio hatchback. This is an all-new car from Maruti that slots somewhere between an Alto and Wagon R. Truth be told, it’ll most likely replace the A-Star, and – having driven the Maruti Suzuki Celerio – I would go so far as to say that it also gives Maruti’s newly named (in this case, rather optimistically) ‘Stingray’ something to think about. The Maruti Suzuki Celerio is a great new hatch – it looks pretty good, has well-crafted interiors, and high-speed stability that would see it feel very much home on the Autobahn – but the ‘killer app’ is one very specific piece of tech. You see, the Maruti Suzuki Celerio comes with a five-speed manual transmission (as you would expect), but it also has an automated-manual – which, for all practical purposes, works exactly like an automatic transmission. To give you a little background, traditional automatics have torque converters to transmit engine speed to the wheels – these are not only complex (read: expensive), but they also sap a certain amount of power and efficiency. There are, of course, double-clutch gearboxes, but they take complexity (read: cost) to a whole other level. There are also Continuously Variable Transmissions (CVT’s), but they don’t do much for driving pleasure – or cost for that matter. There is one more transmission mind you, the single clutch automated manual. Now, this seems quite exotic because it has its roots in Formula 1 racing. The first road car to get a semi-automatic gearbox was the Ferrari F355. BMW even used a sequential-manual (as they referred to it) in the famed M3. But translating F1 technology to the road isn’t exactly straightforward – and while the gearbox was lightning fast, it had the potential to give you a jolt fierce enough to alter the alignment of your vertebra. Since then, dual-clutch gearboxes have taken precedence, and even traditional torque converters have become so advanced and responsive that automated manuals have all but disappeared. Till now, that is. You see, the automated manual in the F355 had a V8 to contend with – whereas, in the Maruti Suzuki Celerio, it’ll only have to deal with 67bhp and 90Nm of force generated by the 1.0 litre Alto K10 engine. And it deals with this exceedingly well. The gear lever is bereft of a ‘Park’ position that you would normally find, but, other than that, it operates exactly as an automatic transmission would. The shifts are extremely smooth, although I did find a distinct lag on the up-shifts under part throttle. The effect of this is that, in normal driving conditions, you are aware when the gearbox is changing up – but it’s not uncomfortable. In fact, the downshifts are quite smooth and reasonably quick as well. The gearbox is tuned to work its way up the box as quickly as possible – to improve fuel economy – so it finds fifth gear sooner than you would expect (a gear indicator in the instrument cluster keeps you well informed). But, as soon as you step on the gas, the gearbox shifts straight to second to provide you drive when you need it. It also holds gears all the way to the redline if you ask it to – by being aggressive with the accelerator pedal that is. You can also flick the gear lever to one side, and choose to shift yourself if you feel a bit racy. And, again, while the shifts aren’t particularly quick, the levels of urgency improve dramatically in this mode. The responsiveness of the engine and gearbox combo is far greater when you choose to hustle the gear lever yourself. On the whole, I have to say that I was very impressed with Maruti’s execution of this gearbox. There are innumerable lines of code hidden underneath that ensure everything works harmoniously together. And while a lot of the credit must go to Maruti-Suzuki engineers for ensuring the seamless delivery of this technology, a lot of credit must also go to Magneti Marelli, which has developed the electronic control unit and clutch actuator for this automated manual. Magneti Marelli, of course, is the Italian components major that worked with Ferrari to develop such a transmission in F1 to begin with. On their part, Maruti-Suzuki engineers claim that this brand new gearbox is the lightest gearbox of its size in the world. The clutch and internals of the gearbox are shared between the automated manual and the traditional manual transmission. The differences include the control unit, clutch actuator, and a bevy of software programs to ensure that it all runs smoothly. Which it does, as our initial test drive proved! How much of that is due to the Magneit Marelli components, and how much is due to its implementation is something that will likely be answered in the near future. You see, Tata Motors and M&M are both introducing automated manuals on their vehicles in the near future (the brand new Tata Bolt hatch & Zest compact sedan and Quanto compact SUV respectively). So, it seems that this technology is set to cause quite a stir in the Indian market – especially since the price tag over that of a traditional manual is expected to be incremental in each instance, and, more importantly, the fuel economy is expected to remain unchanged. Moreover, since the clutch and internals of the gearbox are the same, repair costs will be largely the same as well. What about the traditional manual version of the Maruti Suzuki Celerio, then – lest we forget about it altogether? Well, the clutch pedal and gear lever are extremely light – to the extent that they really do make you wonder if you even need an automatic to begin with. The shifts themselves are near perfect, and the gear lever is mounted at just the right spot on the floating centre stack. The interior, meanwhile, is well laid out and quite spacious. I do wish the door pads were a little more substantial though, but that would eat into shoulder room in the cabin. 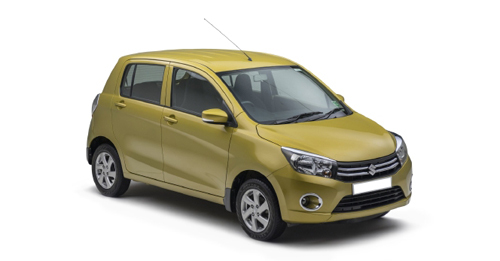 Clearly, this car is built to a cost – that’s the very nature of machines in this segment – but you would be hard pressed to point that out in the Maruti Suzuki Celerio AMT. It really is quite an enjoyable compact hatch to drive – one that I wouldn’t mind getting behind the wheel of at all. I would still prefer the manual though!